A nurse by profession, Assemyne had a basic understanding of what sickle cell anemia was, having worked with patients affected by the condition in the past. But she never thought of the possibility that it might one day touch her own life. So when her doctor ordered a test for the disease just a few months into her pregnancy with her son Florian in 2002, it came as a big surprise when the test returned positive. “I knew was that kids born with sickle cell had a different quality of life, given that they had to manage a chronic illness and that it was a condition that was more common in the black community,” she explains. “But I had a lot more to learn. 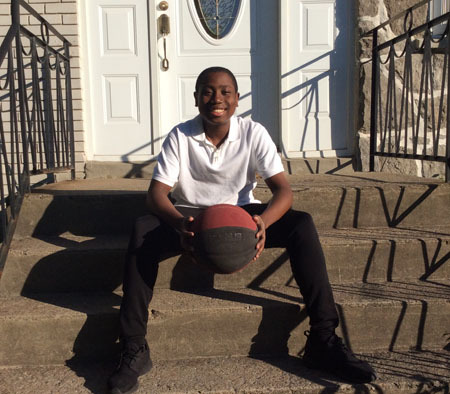 I was worried, but I was grateful to have found out right from the start and knew that I could take care of him.” Shortly after learning about her son’s diagnosis, Assemyne was referred to the Montreal Children’s Hospital’s Sickle Cell Clinic for further follow-up. Sickle cell anemia is an inherited blood disorder that affects a protein in red blood cells called hemoglobin. “In healthy people, these red blood cells are round and flexible. But in people with sickle cell disease, blood cells are irregularly shaped which can cause a range of health problems that can be serious if not properly managed,” explains Marie Gale, Florian’s nurse, who has followed him since birth. The Montreal Children’s Hospital is one of four designated health centres in Quebec mandated to care for patients born with sickle cell disease, with a clinic that includes over 140 pediatric patients. Thanks to early testing, patients are now identified either before or right after birth and the clinic has seen consistent growth over the last few years. The benefits, says Marie, are numerous for patients. “We can begin the education about sickle cell disease right away, before the children have any issues related to the condition,” she explains, adding that some complications may be prevented.